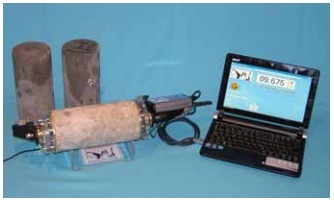 Merlin is used to measure the bulk electrical conductivity, or its inverse, the bulk electrical resistivity, of saturated 100 mm diameter concrete cylinders or cores with lengths up to 200 mm. 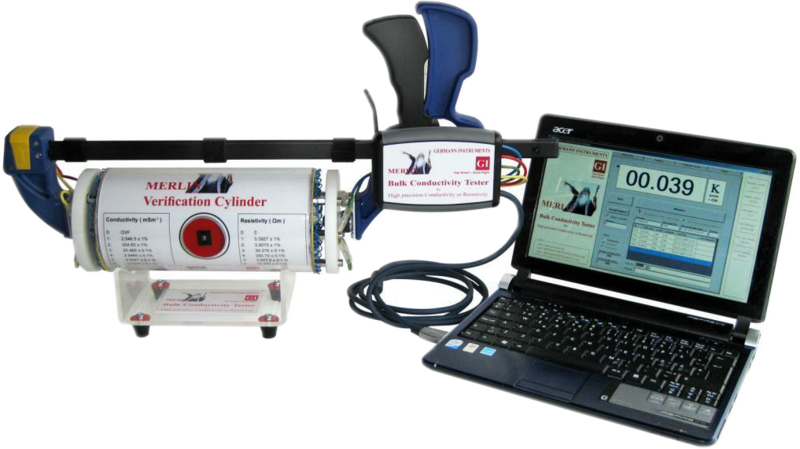 The test is simple to perform and a measurement is obtained within two seconds. The conductivity of a saturated concrete specimen provides information on the resistance of the concrete to penetration of ionic species by diffusion. The term bulk is used to indicate that the measurement is made through the specimen as opposed to a surface-based measurement. Evaluation of in-place concrete (using cores). The electrical resistance R of a conductor of length L and uniform cross-sectional area A is given by the equation shown in the figure to the right. The quantity ρ is the electrical resistivity and is a material property, with units of resistance multiplied by length, such as ohm·m. If the electrical resistance R of a specimen of length L and area A is measured, the resistivity can be calculated from the relationship ρ = R A/L. The inverse of electrical resistivity is the electrical conductivity, σ. The inverse of ohms is a unit called siemens (S). Therefore, electrical conductivity has units of S/m. For concrete, it is convenient to express electrical conductivity in millisiemens per meter or mS/m. Dw = diffusion coefficient of the specific ion through water (Mills and Lobo 1989). If the conductivity of the pore fluid is assumed to be similar among different concretes, the measured bulk electrical conductivity is related directly to the bulk diffusion coefficient (Berke and Hicks 1992). 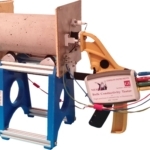 Measurement of the bulk diffusion coefficient of a particular type of ion through concrete is a time consuming process, while electrical conductivity can be measured in a matter of seconds. The electrical conductivity of saturated cement paste is related to the volume of pores and how they are connected within the paste. The paste porosity is related to the water-cementitious materials (w/cm) ratio, the types of supplementary cementitious materials (SCMs), and the degree of hydration. For the same w/cm and degree of hydration, the use SCMs reduces pore size and increases the tortuosity of the pores and, thereby, reduces electrical conductivity and the ease of fluid penetration. The following is a schematic of the measurement method incorporated in Merlin. 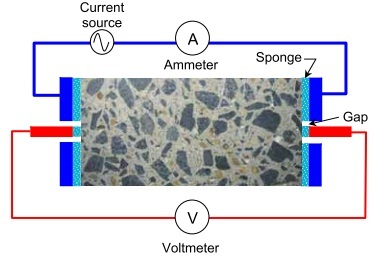 The four-point measurement method that is used provides an accurate measure of specimen resistance by minimizing the effects of the conductive sponges and the pressure applied to the electrodes. The specimen must be in a water-saturated condition to obtain a meaningful measurement. where, L is the specimen length and A is the specimen cross-sectional area. The bulk resistivity is the inverse of the bulk conductivity, that is, ρ = 1/σ . 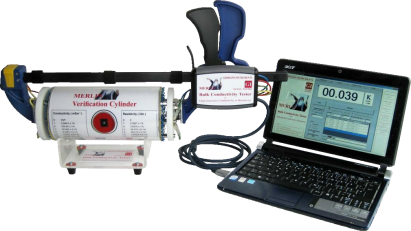 A 100 by 200 mm verification cylinder is provided to check that the Merlin system is operating correctly. 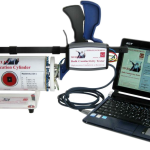 The cylinder includes a push button switch than can be used to select one of several precision resistor from 10Ω to 1 MΩ. For example, if the 1000 Ω resistor is selected and the system is functioning correctly, the displayed conductivity of the verification cylinder should be 25.46 mS/m and the resistivity should be 39.27 Ω•m. 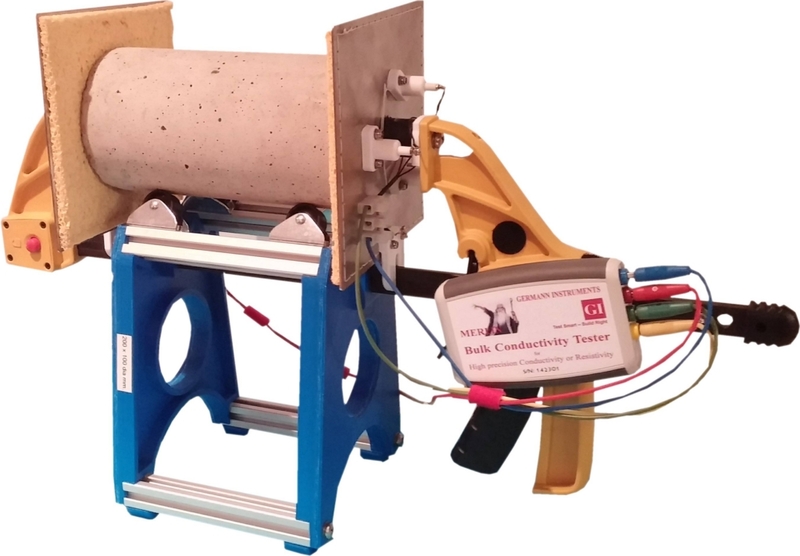 From the theoretical basis of the Merlin, it can be seen that measurement of the bulk electrical conductivity of a saturated concrete specimen also provides an indication of the diffusivity properties of the concrete. If the test is conducted at a consistent degree of hydration for a given combination of cementitious materials, the variation in measured bulk electrical conductivity can be used as an indicator of variation of w/cm using a pre-established correlation. If the bulk electrical conductivity of the approved concrete mixture for a project is known, that value can be used for quality control and quality assurance. Thus Merlin has the potential to be considered as a surrogate test to verify the w/cm of a specimen. The bulk resistivity limits can also be calculated by taking the inverse of the above equation. Data have been published on the relationships between bulk conductivity and other durability related properties, such as permeability, chloride diffusion, and charge passed. E. Karkar (2011) performed a study from which measured using the Merlin can be compared with results of other test methods. The study involved nine concrete mixtures, made with different cementitious materials, and with w/cm values between 0.40 and 0.50. Concrete cylinders, 100 by 200 mm, were made and cut into disc specimens approximately 50 mm long. The discs were water saturated and tested at ages of 35 and 56 days. The following properties were measured: bulk electrical conductivity by measuring the current at 1 minute and at 5 minutes using the ASTM C1202 apparatus; bulk conductivity using the Merlin; charge passed in accordance with ASTM C1202; chloride ion migration coefficient in accordance with Nordtest Build 492 “Chloride Migration Coefficient from Non -Steady-State Migration Experiments.” After measurement of their bulk conductivity, the discs were tested in in accordance with ASTM C1202 or Nordtest Build 492. 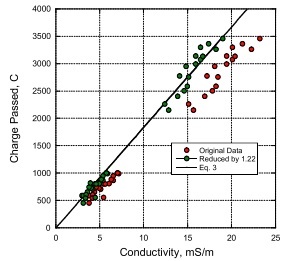 The above graph shows the Coulomb values measured by ASTM C1202 versus conductivity measured with Merlin on the same discs. The straight line is the relationship given by Eq. (3) for a specimen diameter of 95 mm and length of 50 mm. It is seen that the bulk conductivity measured with Merlin is systematically greater than expected based on Eq. (3). Hence the measured values have been reduced by a factor of 1.22. The reduced values, which are plotted as green points, are now in agreement with Eq. (3). The reason for this discrepancy was not addressed by Karkar (2011). Thus a rapid measurement of bulk conductivity will provide the same information as the 6-h test. According to the Nernst-Einstein equation, Eq. (1), the bulk chloride ion diffusion coefficient is expected to vary linearly with bulk electrical conductivity of concrete, assuming that the pore fluid conductivity is the same. The chloride ion migration coefficient determined by Nordtest Build 492 is not identical to the chloride ion diffusion coefficient, but it has been shown that the two are correlated to each other (Frederiksen et al. 1997). Thus we would expect the migration coefficient to also be a linear function of bulk conductivity assuming the same pore fluid conductivity. 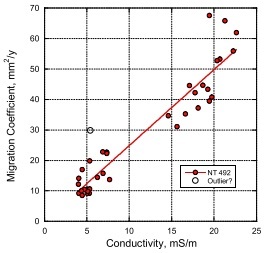 The plot on the left, based on the data by Karkar (2011), shows the migration coefficient plotted as a function of bulk conductivity measured by Merlin. While there is data scatter, it is clear that there is a consistent relationship between bulk conductivity and chloride migration coefficient, which is related to the chloride diffusion coefficient. 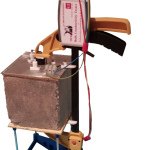 An electrical conductivity test will provide an indication of the chloride diffusion coefficient of the concrete only if the specimen is saturated. Thus it is essential that cylinders be kept under water from the time of molding until time of testing. Reusable steel molds are available to provide specimens of consistent dimensions and to facilitate storage under water. Except for the ends, the cylinder should be in a surface dry condition at time of testing with Merlin. Special caps are available to keep the cylinder ends wet while the side surface is allowed to dry. Because of the high sensitivity of the measurement method, the specimen must be supported on an insulated stand during the measurement. For cores drilled from structures, steps are needed to bring the specimens to a saturated condition before testing. Optional accessory apparatus for preparing cores can be ordered. The following vacuum saturation procedure based on ASTM C1202 is recommended. Trim cores to desired length using a diamond saw. A length of at least 100 mm or three times the nominal maximum aggregate size, whichever is larger, is recommended. Place specimens in a vacuum desiccator and reduce internal pressure to an absolute pressure to 7 kPa or lower. Maintain vacuum for 3 h.
With vacuum pump running, allow de-aerated water to enter desiccator until specimens are covered with water. Allow vacuum pump to run for an additional hour. Turn off pump, release vacuum, and allow specimens to soak for 18 ±2 h.
The conductivity of the pore solution affects the measured bulk conductivity of concrete. Thus comparisons should not be made between concretes with widely different pore solution conductivities. For example, the use of calcium nitrite as a corrosion inhibitor will increase the conductivity of the pore fluid, and the measured bulk conductivity of the concrete will be higher than for another concrete without calcium nitrite but with a similar chloride ion diffusion coefficient. On the other hand, concrete with supplementary cementitious materials may have a reduced pore fluid conductivity, which will reduce the measured bulk conductivity while the actual diffusion coefficient may not be reduced (Liu and Beaudoin 2000). Berke, N.S. and Roberts, L.R., 1989, “Use of Concrete Admixtures to Provide Long-Term Durability from Steel Corrosion,” Third CANMET/ ACI International Conference on Superplasticizers and Other Chemical Admixtures in Concrete, Ed. V.M. Malhotra, Ottawa, Canada, October 4-6, 1989, ACI SP 119, American Concrete Institute, p. 383-403. R. Mills and V. M. M. Lobo, 1989, Self-Diffusion in Electrolyte Solutions, Elsevier, New York. The MRLN-1009 precision steel mold produces cylinders with a diameter of 100 mm and a length of 200 mm with an accuracy of 0.02 mm on the cylinder dimensions. The steel mold is reusable and mold removal is simple. To remove the mold, the top and bottom lids are removed first. Then, the container is opened slightly by applying a small pressure with the screws in the welded flanges. The mold allows specimens to be produced within the tolerances stated and with plane end faces that are perpendicular to axis of the specimen. This minimizes test variability due to specimen geometry.